Fits Mattresses Size 54 in. x 80 in. Complete Set! Top sheet, fitted bottom sheet, and two matching standard/queen pillowcases. 100% cotton for softness and care free enjoyment. Proudly sewn in the USA! Fits mattresses 7-15 inches thick. Generous 300 Threads per square inch count. For the price these are the best sheets on the market! Please choose a color from the drop down menu. 95% of our orders ship within 5-10 business days. Please allow standard ground transit time depending on your location. Please check the box above to add the comforter to your order. Please check the box above to add a quilted mattress pad to your order. The top of the mattress pad is cotton for comfort,and the fill is 100% polyester for some cushioning. There is stretchy material along the entire perimeter of this mattress pad including the pockets for a sure fit. This pad lays directly on top of the mattress for protection. This mattress pad is not waterproof. This mattress pad is cold water machine washable with a cool tumble dry, no bleach. Please allow 5-10 business days to ship plus a few days in transit. Fits Mattresses Size 54 in. x 80 in. This is a complete set which includes the Top sheet, fitted bottom sheet, and two matching standard/queen pillowcases. 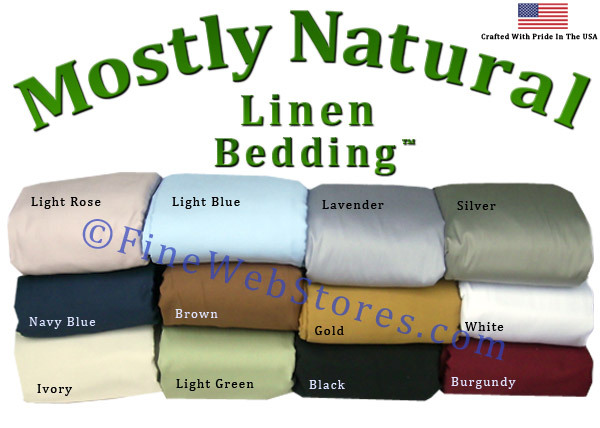 These sheets are made of 100% cotton for softness. Fits mattresses 7-15 inches thick. There is a generous 300 Threads per square inch count.